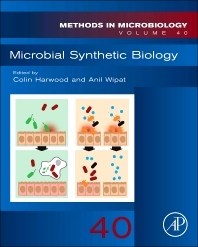 The 40th volume of Methods in Microbiology focuses on microbial synthetic biology. Synthetic biology is a rapidly growing discipline that builds on well-established principles of genetic engineering and biotechnology by integrating computational and engineering approaches to the design and construction of novel biological systems. This volume addresses some of the major technical challenges stand in the way of achieving a radical step-change in our ability to engineer complex multi-scaled biological systems. These include: the application of computation intelligence to the design of synthetic microbial systems, design automation and constraints; the impact of noise and stochasticity; the engineering of biosensors; the characteristic of a model bacterial chassis. A key issue in Synthetic Biology is that of its social dimensions and a chapter is dedicated to the important issue.